We love the Pointers, at least all those we have met so far. 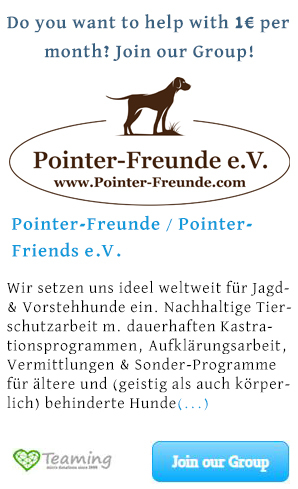 We help pointers in need. And we want to report on how the stories behind these sensitive dogs shake our world again and again whilst enriching it at the same time. Get to know a pointer and you will see and feel what I mean. The Pointer deserves recognition and we want to help, through our expression and voice. The Pointer is a family dog: loyal, welcoming and warm. We are looking for people who feel the same way and want to support us in telling the world about Pointers. We don’t won’t to discuss our help and love for the Pointers. There is plenty to do in order to alleviate the suffering with a view to sustainability. We must call things by their name, reveal the root of the problem or the dead ends and find solutions and solve as many as possible. This will be a long hard road, but we will walk it and try as much as possible to improve, and whenever necessary to help.